I take a realistic view of cooking. When I can, I’ll do a start-to-finish meal from scratch. Ask The Hubs about the time I made sloppy joes with homemade hamburger buns. But sometimes, I’m just tired and I build a meal using store-bought stuff. So, buy a bottle of Asian marinade and make this salmon. A note: Please do get fresh pineapple/mango/peach for this. Canned won’t work. How do I manage fresh pineapple but not homemade teriyaki sauce? I cut up a pineapple on Sunday and make these sometime that week. Cut the salmon into chunks the same sizes as the fruits/veggies. Marinate in the asian marinade/teriyaki sauce + a spoonful of ginger/garlic paste + a squirt of sriracha sauce. Leave it in the fridge for an hour if possible. 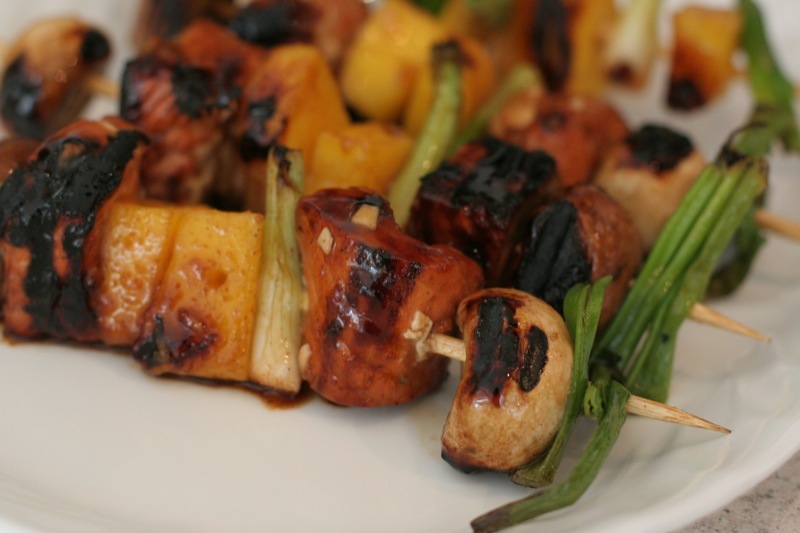 When you’re ready to grill, soak some wooden skewers in water for a few minutes so they won’t burn. 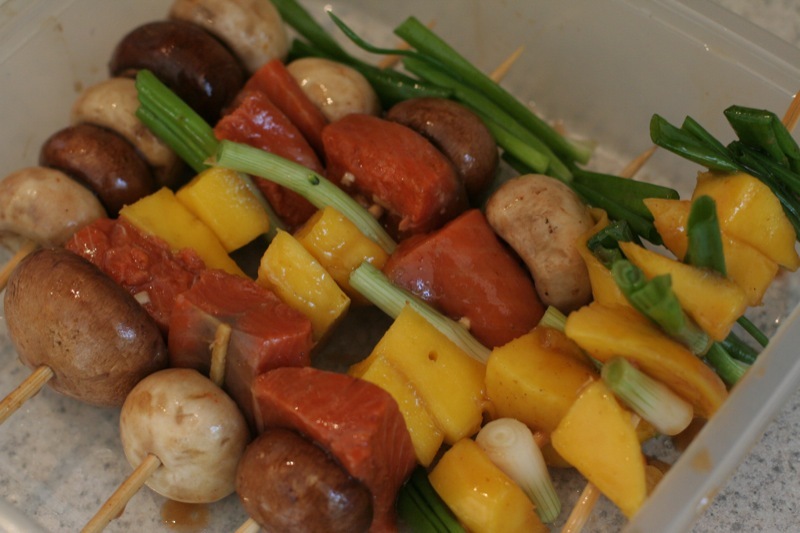 Then, carefully thread the salmon, mushrooms, scallions, and pineapple/mango/peach onto the skewers. Grill on a medium-high grill pan for 3 minutes on each side. DON’T touch it when you first put it in; the salmon will release a bit when it’s ready to let go and be turned. Work with it. 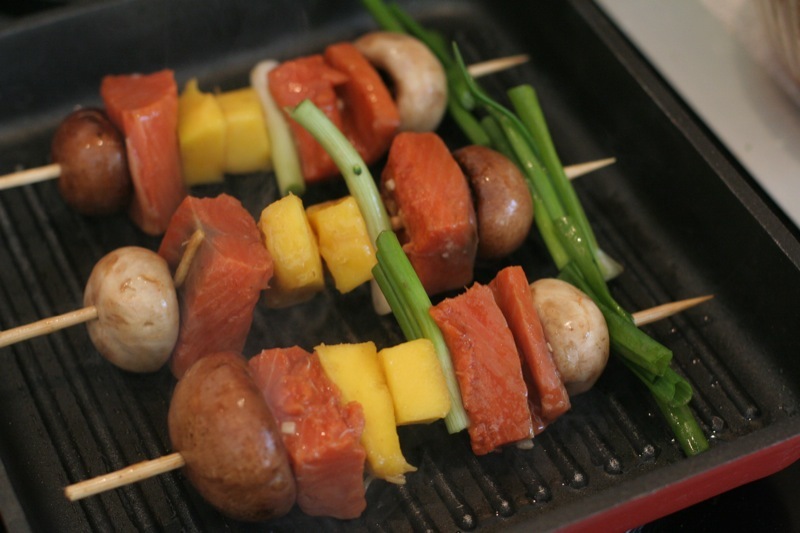 For more flavor, glaze the salmon with marinade as it grills. Need a side dish? Oh, I’m so glad you asked. Preheat an oven to 400F. Drizzle broccoli florets and carrots, cut to the same size, with a little bit of toasted sesame oil and sprinkle with salt and pepper. Roast for about 15-20 minutes till the veggies are soft and caramelized on the edges. Meanwhile, slice an onion and heat a grill pan. When the pan is quite hot, throw on the onions and grill till they’re slightly soft. With the pan still on, pour a few tablespoons of asian marinade/teriyaki sauce onto the onions and toss to cover. 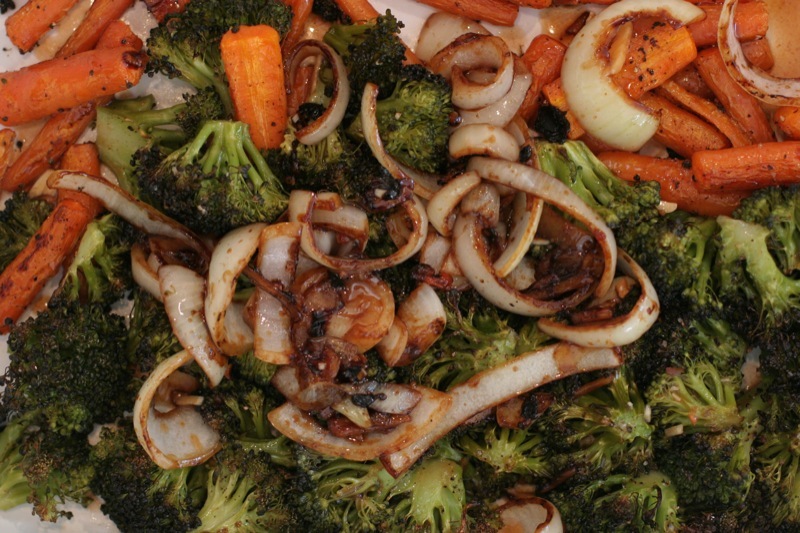 When the carrots and broccoli are done, top and toss with the teriyaki onions. So yum.